Cycle parking is an important part of providing for cycling in Enfield. People need to be able to store their bikes safely at home and then have somewhere suitable to park their bike when travelling to town centres and other destinations. 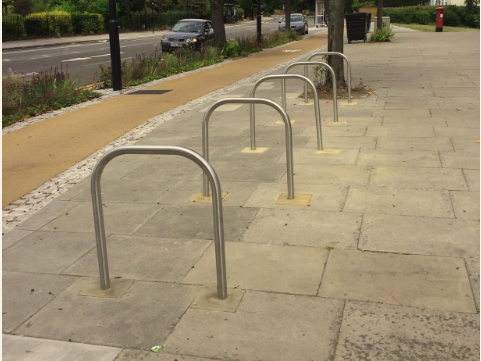 Enfield Council is keen to ensure that cycle parking in public places is placed sympathetically to the street environment, whilst meeting the need for parking bikes conveniently and safely. We welcome requests for cycle parking from residents and businesses in Enfield. Please use our cycle parking request form to suggest new cycle parking. There are different types of cycle parking available to suit the needs of different locations. Short term visitor parking is available in town centres, at community buildings, transport hubs etc, so cycle journeys like a quick ride to the shop, the park or to see friends will become more convenient and accessible. In Enfield we normally use ‘U’ shaped stands, known as Sheffield stands. Where space is limited, cyclehoops may be attached to lamp posts instead. Secure cycle parking is being introduced to residential areas. Our residential Bikehangars can fit 6 bikes in half the space needed to park a car. A hangar space costs £12 per year to rent (with a refundable £25 key deposit). 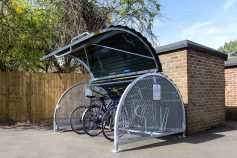 Bikehangars are suitable for areas where lots of people live in flats and inadequate storage options prevent them from cycling. 10 Bikehangars have been installed across the borough and we are planning another 15 locations for 2018/19. We have received suggestions for over 200 secure cycle parking locations from residents and are working hard to prioritise areas of high demand and potential to cycle more where a suitable location can be found. Thank you for sharing your suggestions with us and your patience while we work through the backlog of requests. We will keep you informed on progress. Our first two secure cycle hubs are now available at Enfield Town and Edmonton Green stations. Follow the links below to apply for a space. Members access the Cycle Hub using a smart card. The Cycle Hubs are managed by Cyclehoop Ltd on behalf of Enfield Council. What are the Cycle Hub membership Terms and Conditions? Who manages the Cycle Hub?